Whether you are a scratch golfer swinging from the back tees or just an aspiring amateur chunking and duck hooking your way up the fairway, the Elgin Area has no shortage of lush, championship level courses for golfers of all skill sets to test their mettle and woods. Elgin’s Bowes Creek Country Club is an 18-hole public golf course designed by award-winning architect Rick Jacobson. Named Illinois’ top rated golf course overall and #21 in the nation by Golf Advisor, the rustic setting features expansive fairways and sweeping bunkers with fingers of grass drifting into the sand and fescue grasses edging the bunker faces. The course has five sets of tees for each hole and distances ranging from 6,900 yards to 5,100 yards to accommodate the dramatically different skill and experience levels of golfers. This environmentally planned course integrates all the natural elements the native landscape has to offer, including Bowes Creek, improved woodland and wetland areas, a lake, rolling farmland, stands of mature trees and scenic bluff slopes to create an aesthetically pleasing, playable and challenging course. Top shelf amenities include a fully-equipped pro-shop, an elevated, 30-station driving range with target greens at varying distances, putting and chipping greens and Porter’s Pub, a casual, cozy, English-style restaurant and bar. Book your next tee-time. The Highlands of Elgin has become a premier destination for thousands of golfers throughout the region. Nine new holes reclaim an old stone quarry, and take maximum advantage of the unique and dramatic land forms that were left behind, including a twelve acre quarry lake. Four holes hug the top of the bluff thirty to forty feet above the water providing golfers with incredible views and numerous shot options on each hole. The original nine holes flow over beautiful rolling terrain, creating a diverse collection of holes. The prairie style clubhouse features an expanded golfshop, locker rooms, golf simulator and stunning views from The Grumpy Goat Tavern, which offering a Creole/Cajun inspired menu of craft burgers, signature sandwiches, pasta, steak & seafood paired with an extensive bourbon, whiskey, wine and craft beers list. The facility also features a lighted practice facility offering bent grass tees, 20 hitting stations, short game area and a 9,000 sq. ft putting green. The Highlands of Elgin was recently named Illinois’ #9 overall rated course by Golf Advisor, giving Elgin two of the top 10 golf courses in Illinois. Book your next tee-time. For the golfer with only a couple of hours to spare, Elgin’s Wing Park golf course is a classic yet, sporty nine-hole golf course. Established in 1908, it is the oldest nine-hole municipal golf course. This superior golf course offers something for everyone. Holes are regulation in length and the green size is small, typical of a Victorian period course. A few bunkers and a small water feature are the only obstacles on the course. Rental clubs are available and tee times are recommended, especially on the weekend. Book your next tee-time. Just a short putt east in nearby Bartlett, Bartlett Hills Golf Club offers nearly 6,500 picturesque, tree-lined yards of challenging golf, Villa Olivia Country Club features 18 holes lined with mature trees, rolling hills and during the winter a variety of skiing, snow boarding and snow tubing options and the 9-hole Apple Orchard Golf Course. 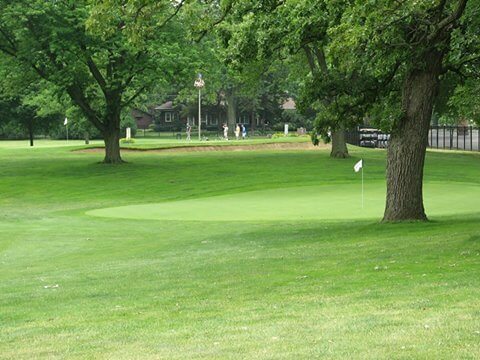 For more golf excitement get in your cart and head north of Bartlett to Bonnie Dundee Golf Club in Carpentersville. Bonnie Dundee was established in 1920’s to draw golfers of all skill levels and ages. Continue the fun at Randall Oaks Golf Course, Dundee Township Park District’s signature golf address. This course is located in West Dundee, just north of I-90. Don’t use a mulligan here. For golfing excitement, the Elgin Area is an easy tap-in. Come play through.